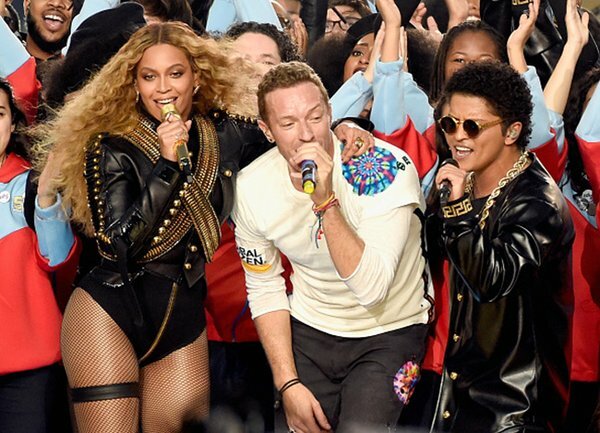 MANILA, Philippines - Coldplay kicked-off Super Bowl 50 Halftime show on Sunday (Monday in Philippine Time) with Beyonce and Bruno Mars. The 38-year-old singer Chris Martin with his band captivated the 70,000 American football fans at Levi's Stadium in Santa Clara, California with their energetic performance. Grammy award-winning artists Beyoncé and Bruno Mars backed Coldplay to wow enthusiastic crowd amidst a technicolor backdrop. Frontman Chris Martin also paid tribute to the annual event’s history in honor of it being the 50th anniversary of the Super Bowl. That’s where Beyonce and Bruno Mars came in, having previously served as the show’s headliners in 2013 and 2014, respectively.